Take a spectacular journey back through time and trace the transformation of a perfect angel into Satan, the arch demon and how he led an army of angels in a revolt in heaven! This powerful resource makes sense of God's character and actions and why He permitted sin to continue at such a great cost. Witness the creation of a beautiful new world... feel the suspense as the devil brings his rebellion to Planet Earth... behold the temptation and fall in Eden... and uncover God's amazing plan to restore people to paradise through the ultimate sacrifice. The battle between good and evil affects every life on earth — don't let you, your family, or friends miss this! 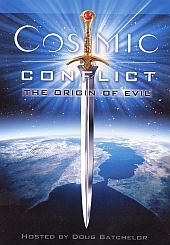 The Cosmic Conflict affects every life on earth – including yours! Audio and Captions: English, Spanish, French, German, Portuguese.